An online master’s in business intelligence teaches students how to collect, research, and analyze raw data and interpret it into meaningful information for businesses. Careers in business intelligence require solid skills in research and analysis. These professionals must also have a deep understanding of the company they are working for. Business is a lucrative and growing field. In 2012-13, more master's degrees were awarded in business than any other field. Business majors with a master's typically make $20,000 to $32,000 more annually than those with a bachelor's. In the financial services sector, business professionals with a master's degree earn $80,000 more than their peers with only a bachelor's degree. If you are interested in research and analysis and you see yourself working in the business world, an online business analytics master's degree is a viable option for you. Boston University ranks #1 on The 10 Best Online Master's in Business Intelligence Programs! BU offers a fully online MS in applied business analytics, with no on-campus requirements. The university understands each student has a unique learning style and customizes courses for individuals. Online students have access to faculty and student support administrators, who monitor group interaction and each student's needs and performance. BU's online MS in business analytics provides business knowledge and analytical skills. Coursework covers topics such as as enterprise risk management, data mining for business analytics, and qualitative decision-making. Graduates pursue positions analyzing data-driven business processes in roles such as management analyst, statistician, and operations research analyst. Most students complete the 40-credit program in 18 to 24 months. BU accepts approved transfer credits, and students with a graduate certificate in applied business analytics may waive the program's four specialization courses. Applicants must submit a graduate application, three letters of recommendation, a self-evaluation, a current resume, and official transcripts. Syracuse University ranks #2 on The 10 Best Online Master's in Business Intelligence Programs! Founded in New York in 1870, SU offers more than 200 majors and 100 minors. The university's quarter of a million alumni are located in 160 countries. Along with Syracuse, SU has campuses in New York City, the District of Columbia, Los Angeles, and abroad. The university offers a number of fully online degrees, including an MS in business analytics. SU students earning their business analytics master's online develop an understanding of analytics through research, data visualization, and analysis. Students customize the degree through a variety of elective options. To facilitate effective communication between students and instructors, SU uses a backward design approach, which involves setting goals before determining the most effective instructional methods. The faculty comprises experts in the field who are trained in online teaching. Students participate in weekly interactive assignments. Students complete two courses per 12-week term and graduate in as few as 18 months. Applicants must submit an application and an application fee, which is less if submitted by the priority deadline. Applicants must also submit two personal essays, two letters of recommendation, official transcripts, a resume, and GRE or GMAT scores. Candidates should be prepared to complete a personal interview with a member of the admissions committee. Syracuse University is regionally accredited by the Middle States Commission on Higher Education (MSCHE). 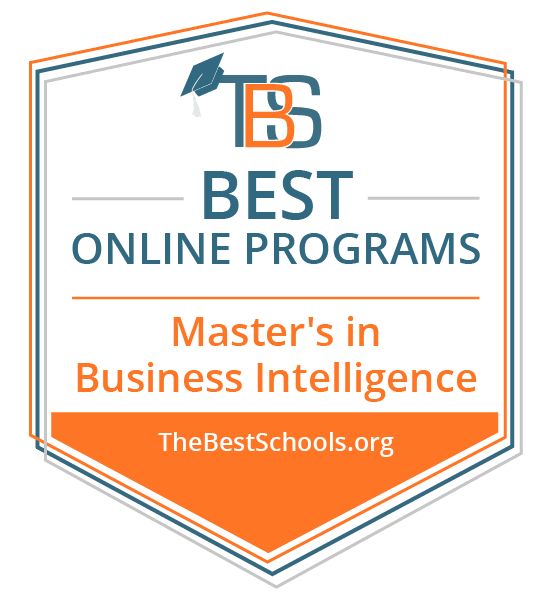 Brandeis University ranks #3 on The 10 Best Online Master's in Business Intelligence Programs! Brandeis offers an online MS in strategic analytics featuring small class sizes and instructors who are trained in online teaching. With an average class size of 12 students, online learners have the opportunity to form close relationships with instructors, who are active professionals in the field. Students participate in virtual meetings, and instructors are available for review sessions, office hours, and group activities in real time. BU's business analytics online master's degree prepares students to translate analysis into effective decision-making for organizations. Core courses include business intelligence, analytics, and strategic decision-making. BU's problem-based learning approach teaches students to collect and analyze data, and electives help students develop specific skill sets. Students complete the 30-credit program in 10-week sessions, and most students earn the degree in about 18 months. However, students may take up to five years to complete the program. Applicants must submit official transcripts, a resume, a statement of goals, and a letter of recommendation. Saint Joseph's University ranks #4 on The 10 Best Online Master's in Business Intelligence Programs! SJU, a Jesuit university in Philadelphia, Pennsylvania, was one of the first schools to offer an online STEM degree; students in the MS in business intelligence and analytics program work with real data and case studies to cultivate skills applicable to positions in diverse industries. Core courses include business analytics and special topics in business intelligence. The program offers three concentrations: general track, data analysis, and programming languages. Graduates receive a business intelligence certificate endorsed by Statistical Analysis System, Inc.
SJU's program consists of two split semesters, and students take a single eight-week course at a time. Most students complete the 30 required credits in two years. Every SJU professor is an expert in their field. Online students have access to a personal student services coordinator and 24/7 technical support. Applicants must submit a graduate application, an application fee, two letters of recommendation, official transcripts, a letter of intent, and GRE or GMAT scores. Creighton University ranks #5 on The 10 Best Online Master's in Business Intelligence Programs! Creighton offers an online MS in business intelligence and analytics that is rooted in hands-on, real-world experience. Creighton's small class sizes allow instructors to provide individual attention for each student. Graduates pursue careers as financial analysts, planners, and advisors. Creighton's online master's in business intelligence requires core major coursework and classes designed to provide practical skills and knowledge, such as ethics classes. Online students have access to a digital library, an online writing center, technical assistance, and academic advising. Online students participate in real-time web conferences with professors and stream audio-visual materials. While most courses are asynchronous and require no scheduled log-in times, they are not self-paced; students meet due dates for weekly assignments. Most full-time students complete the 33-credit program in two years. Applicants must submit a graduate admission application, an application fee, proof of undergraduate degree, two letters of recommendation, a 500-word personal statement, official transcripts, and GMAT scores. University of Colorado Denver/Anschutz Medical Campus ranks among The 10 Best Online Master's in Business Intelligence Programs! CU Denver/Anschutz employs diverse teaching methods and values discovery, innovation, and diversity. The university offers an online MS in information systems with a concentration in business intelligence. Students explore operational data and analytical tools and learn to process data, handle dashboards and scorecards, maintain customer relationships, and manage employee performance. Online classrooms are structured in the same way as on-campus classrooms. Students participate in group activities and class discussions, and professors administer exams and weekly assignments. Students have access to MicroStrategy, Inc., a worldwide provider of business intelligence software. The curriculum covers topics such as IT governance, data warehousing, and business intelligence in healthcare. Students earning CU Denver's online master's in business intelligence can also complete a geographic information systems certificate, which teaches students to map representations that can be isolated in geo-databases. Applicants must hold an undergraduate degree in any field and must submit official transcripts and GMAT scores. While not required, relevant work experience strengthens the application. The University of Colorado/Anschutz Medical Campus is regionally accredited by the Higher Learning Commission (HLC). Arizona State University–ASU Online ranks among The 10 Best Online Master's in Business Intelligence Programs! ASU, a public metropolitan university, consistently ranks among the most innovative schools in the country. ASU's offers hands-on, dynamic online programs, including an online MS in business analytics. Students learn how to extract value from data and lead analyses. Graduates pursue positions such as business intelligence analyst, marketing manager, and chief executive across markets and industries. ASU's online program follows the same curriculum as its on-campus program, and courses are taught by the same instructors. Students complete a single five-week course at a time and have access to a career services team that addresses the needs of working professionals. Coursework covers topics such as data mining and decision modeling, and students complete a three-credit culminating experience. Most students complete the 30-credit program in 16 months. Applicants must have a 3.0 GPA and must submit official transcripts, GMAT or GRE test scores, a letter of recommendation, a current resume, and responses to short-answer questions. Indiana University–Bloomington ranks among The 10 Best Online Master's in Business Intelligence Programs! Founded in 1820, IU offers an online MS in business analytics that emphasizes innovation and collaboration. The program is designed for students who hold an MBA or a bachelor's degree in areas such as business, economics, or statistics. Graduates pursue careers as brand analytics managers, e-commerce project managers, and web metrics analysts. Students complete the 30 required credit hours in as few as 15 months. Coursework prepares students to make accurate business decisions based on analytic modeling, to employ strategic thinking in management situations, and to uncover statistical information from datasets. Most classes last 16 weeks, but some classes are available in formats lasting 6, 8, or 12 weeks. Students have 24/7 access to online course materials. IU Online offers a dual master's degree combining an MBA and master's in business analytics. Applicants must submit GMAT or GRE scores, official transcripts, letters of recommendation, a 500-word personal statement, and a current resume. Applicants should expect to participate in a 30-minute phone interview with a member of the admissions team. Saint Mary's University of Minnesota ranks among The 10 Best Online Master's in Business Intelligence Programs! Saint Mary's University is a Lasallian Catholic school established in 1912. The university serves 4,600 graduate students and has some of the largest graduate programs in Minnesota. Saint Mary's University offers an online master's of science in business intelligence and data analytics. Students earning the business analytics master's degree online study topics such as analytics programming, statistical modeling, and data-driven decision-making. Most full-time students complete the 36 required credits in one year. Saint Mary's University provides user-friendly online learning environments, and coursework is delivered asynchronously so students can complete program requirements at their convenience. Students have 24/7 access to content-sharing tools and all course materials, including syllabi, articles, assignments, tests, quizzes, and discussion questions. Online students interact with classmates and faculty through virtual chats and emails. Applicants must have a 2.75 GPA and must submit official transcripts, a current resume, two letters of recommendation, and a personal statement. Saint Mary's University of Minnesota is regionally accredited by the Higher Learning Commission (HLC). Bellevue University ranks among The 10 Best Online Master's in Business Intelligence Programs! Founded in 1966, Bellevue is a nonprofit university located on a 46-acre main campus in Nebraska. The university serves nearly 9,000 students per year and has campuses in four states. Bellevue offers several entirely online programs, including an MS in business analytics. Students earning the MS in business analytics online gain business knowledge and technical skills. Graduates become leaders who influence business decision-making and work in areas such as business administration, management information systems, and data mining. The program requires 36 credit hours and is ideal for individuals pursuing careers in business analytics and for current professionals who want to advance their careers. Bellevue accepts transfer credits and provides an online tool to help prospective students determine how many of their previous credits Bellevue will approve. Applicants must have a 2.5 undergraduate GPA or a 3.0 graduate GPA and must submit official transcripts and a letter of recommendation. All online students pay the same tuition rate, regardless of residency. The ability to read and analyze business data is a very specialized skill, and those proficient in it are valuable in the business world. Students who complete a master's in business analytics online gain all of the skills and knowledge needed to excel in business intelligence. Courses include statistical methods, primary data collection, management decision methods, data mining and reporting, business intelligence analytics, data visualization and creative reporting, and business intelligence case studies. Programs typically include capstone projects for students to showcase all they have learned throughout the program. Business intelligence and business analytics degree programs can be completed online in as little as one year. Concentrations and minors are available in business intelligence, data analytics, and data management. Programs focus heavily on technology and the ways it can be used in research and analytics. Courses are very detailed and are meant to provide students with enough knowledge to immediately begin a full-time position as a business intelligence analyst, a business intelligence project manager, or analytics within data services. However, each school differs in factors such as whether classes are synchronous or asynchronous, if students are required to write a thesis, and which elective courses are offered. An online master's in business intelligence qualifies graduates to choose from a variety of career options, including analyst, project manager, developer, manager, administrator, and consultant. Business intelligence specialists work primarily in the finance industry, but there is a need for them in other business-related industries as well. Management Analyst: Management analysts formulate plans to improve the overall efficiency of a company. They advise managers on how to make companies more profitable by reducing costs and increasing revenue. They travel frequently for work in order to meet and consult with new clients. Financial Examiner: Financial examiners review balance sheets, evaluate the risks associated with different loans, and oversee bank management. They ensure compliance with laws regarding financial institutions and transactions. They often work in finance, insurance, and federal and state government. Financial Analyst: Financial analysts offer guidance to businesses and individuals regarding their investments, including stocks, bonds, mutual funds, and annuities. They regularly research and review performance to ensure their clients make the best investments possible.